The classic Drawing Textbook can be used by the independent learner or in the small family setting to learn the basics of drawing. How do you teach art when you aren’t an artistic type? One thing you can do is teach art history. Learn alongside your student with hands-on art projects if you are artistically challenged. One art history homeschool curriculum that combines art history with hands-on art projects is Artistic Pursuits. 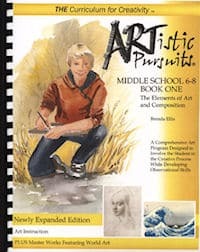 It is a well-planned art series for grades K to 12 and is designed with the homeschool setting in mind. From How Great Thou Art, comes a course about God and the History of Art. 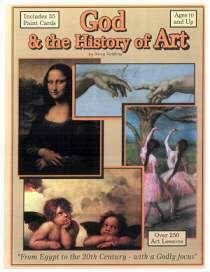 Barry Stebbing wrote this four-year art history and hands-on art curriculum for children ages 10 and up. This is the third edition of The Annotated Mona Lisa. It includes a new chapter about recent artists and movements. Take art education out of the realm of dreary textbooks, demystify jargon and theory, and make the history of art movements accessible to beginning art museum-goers – even at a cursory reading. From Stonehenge to the Guggenheim and from African art to Warhol, more than 25,000 years of art is distilled into five sections (prehistoric and medieval, renaissance and baroque, the nineteenth century, modern art, and contemporary art) covering a little more than 230 pages. Reasons The Annotated Mona Lisa is a good choice for homeschool art history textbook. Each section begins with side by side world history and art history timelines to help your student connect art events with eras. Learn how to analyze a painting and read about paintings. A high school student could read this independently. It does not have lesson plans or art activities, but I suggest assigning chapters/pages per week, quarter, or semester depending on your schedule. Read aloud to younger students for a multi-level art history course. 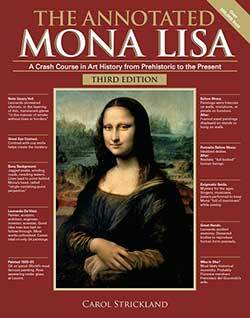 The Annotated Mona Lisa can also supplement other homeschool art courses such as Artistic Pursuits.